There are four species of Ptosima in eastern and midwestern United States to Texas (Arnett et al. 2002). Arnett, R.H., Jr., M.C. Thomas, P. E. Skelley & J.H. Frank. (editors). 2002. American Beetles, Volume II: Polyphaga: Scarabaeoidea through Curculionoidea. CRC Press LLC, Boca Raton, FL. xiv + 861 pp. Borror, D.J. 1960. Dictionary of Word Roots and Combining Forms. National Press Books, Palo Alto. v + 134 pp. Cobos, A. 1980. Ensayo sobre los géneros de la subfamilia Polycestinae (Coleoptera, Buprestidae) (Parte I). EOS, Revista Española de Entomologia 54(1978): 15-94. Hespenheide, H.A.1974. Notes on the ecology, distribution, and taxonomy of certain Buprestidae. The Coleopterists Bulletin 27(4)(1973): 183-186. Nelson, G.H. 1978. A review of the genus Ptosima in North America (Coleoptera: Buprestidae). The Coleopterists Bulletin 32(4): 327-336. Nelson, G.H. 1987. Additional notes on the biology and distribution of Buprestidae in North America, II. The Coleopterists Bulletin 41(1): 57-65. Nelson, G.H. & R.L. Westcott. 1976. Notes on the distribution, synonymy, and biology of Buprestidae (Coleoptera) of North America. Coleopts. Bull. 30(3):273-284. Nelson, G.H., D.S. Verity & R.L. Westcott. 1981. Additional notes on the biology and distribution of Buprestidae (Coleoptera) of North America. Coleopterists Bulletin 35(2): 129-151. MacRae, T.C. 2006. Distributional and biological notes on North American Buprestidae (Coleoptera), with comments on variation in Anthaxia (Haplanthaxia) viridicornis (Say) and A. (H.) viridfrons Gory. The Pan-Pacific Entomologist, 82(2): 166–199. MacRae, T.C., & G.H. Nelson. 2003. 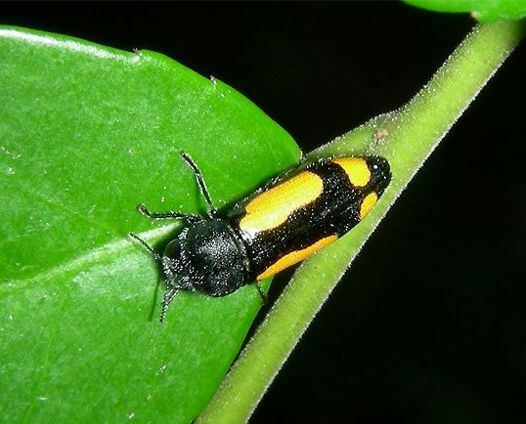 Distributional and biological notes on Buprestidae (Coleoptera) in North and Central America and the West Indies, with validation of one species. The Coleopterists Bulletin, 57(1): 57–70. Say, T. 1823. Descriptions of coleopterous insects collected in the late expedition to the Rocky Mountains, performed by order of Mr. Calhoun, Secretary of War, under command of Major Long. Journal of Academy Natural Sciences of Philadelphia 3(1): 9-54, 73-104, 139-216. Solomon, J.D. 1995. Guide to insect borers of North American broadleaf trees and shrubs. Agriculture Handbook 706. U.S. Department of Agriculture, Forest Service, Washington, D.C. 735 pp. Westcott, R. L., W.F. Barr, G. H. Nelson, & D.S. Verity. 1979. Distributional and biological notes on North and Central American species of Acmaeodera (Coleoptera: Buprestidae). The Coleopterists Bulletin 33(2): 169-181.